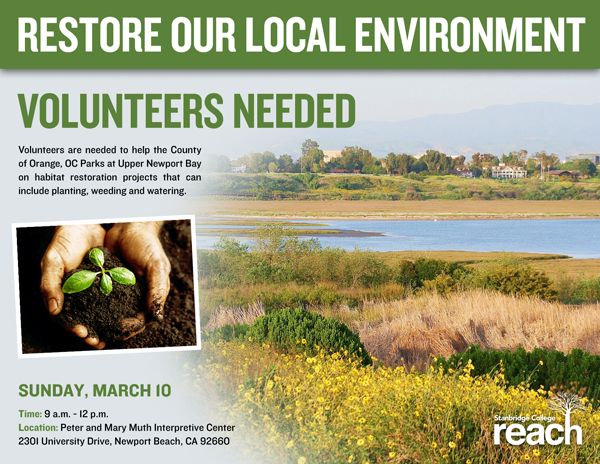 Stanbridge College REACH – Beyond the Classroom™ is looking for volunteers to help the North Coastal Operations of the County of Orange, OC Parks at Upper Newport Bay with a monthly habitat restoration project on Sunday, March 10, 2013. Every 2nd Sunday, volunteers are needed to help habitat restoration projects that can include planting, weeding and watering. Join Preserve staff and other volunteers in enhancing the Bay’s habitat for local wildlife. No experience is necessary; water, snacks and tools are provided by OC Parks. This is a great opportunity to serve your community, learn more about natural history, get exercise and fresh air and contribute to the health of the environment! Sign up and help Orange County start its spring cleaning today!